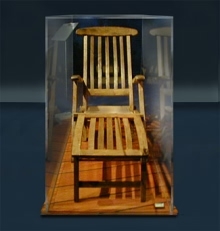 An actual deck chair recovered from the sunken liner Titanic. The earliest use of the phrase, "rearranging the deck chairs of the Titanic," appeared in the New York Times of 15 May 1972, describing the activities of the administrators of Lincoln Center. See the Internet Archive for more information. Photo courtesy Titanic.com. To "rearrange the deck chairs of the Titanic" is a metaphor commonly used to describe futile, irrelevant actions taken in times of crisis. It refers to the passenger liner that sank in 1912 after grazing an iceberg in the North Atlantic. Rearranging its deck chairs after the collision would have been futile and irrelevant, if not tragically comical. The behavior pattern this metaphor suggests is astonishingly common in organizations — astonishing because so much of the work we do is irrelevant to the goals our organizations espouse. These first examples of manifestations of deck-chair behavior emphasize obvious waste. Deflective activities are those that we don't need to do right now, and maybe don't ever need to be done. But we apply resources and people to them anyway. Some of those working on deflective activities sense that their efforts are wasted, but they're either afraid to mention this to management, or they've tried already, to no avail. In the worst case, the people working on deflective activities are management. The truly dangerous deflective activities have no end date and no definite objective. Sometimes their costs aren't tracked at all, which enhances their life expectancy. Once in a while, even those who are determined to spend their time rearranging the deck chairs have to work on relevant tasks. But when they do, they tend to invert priorities, occupying themselves with unimportant details. Examples include preparing beautiful graphics for presentations that have only internal audiences, perfecting the layout of a Web page that's useless or worse because it has outdated or incorrect information, or having meeting after meeting about the color scheme of the third floor while failing to address the facility-wide overcrowding problem. are managementattending, long before they get down to the important issues. Sometimes this happens because of rigid adherence to rules, such as "no item shall remain unaddressed for longer than 10 days." Rules such as these force unimportant items to the top of the agenda ahead of issues far more serious. Agenda cluttering can also happen because of an unspoken agreement not to address the difficult issues. By mucking about in the agenda clutter, we can avoid addressing the difficult questions. Would you like to see your comments posted here? rbrenHlKRnrBLNQqARfoXner@ChacfQUTKrTpXdZjhemLoCanyon.comSend me your comments by email, or by Web form. I offer email and telephone coaching at both corporate and individual rates. Contact Rick for details at rbrenCHaWFOuVlgLdOOmDner@ChacyMzjQTPBDqxywPXtoCanyon.com or (650) 787-6475, or toll-free in the continental US at (866) 378-5470.